My son loves cake and icing as much as I do. 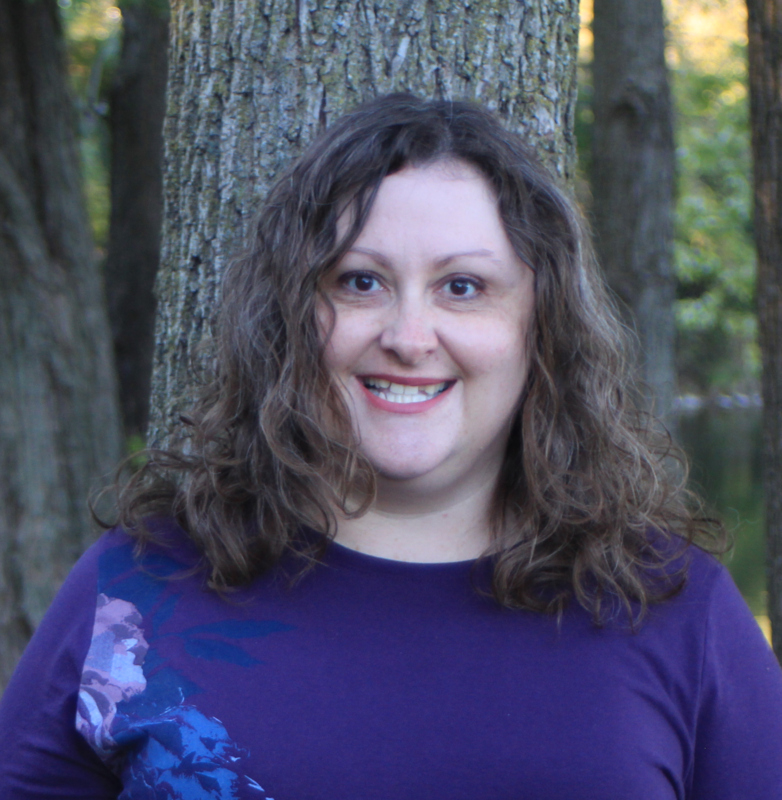 I’m thankful for that since my daughter and husband don’t share that love! So, I am happy to make cupcakes for his birthday parties. He likes to have both vanilla and chocolate. I can whip them up for a fraction of a cost from the bakery and thanks to some tips I’ve gotten from others and learned on my own, they usually are fresher and taste better than a bakery! Even better, none of my tips require you to be a professional, highly-skilled baker. I certainly am not. They also don’t require lots of kitchen equipment or weird ingredients. With just a few tweaks, you can turn a boxed caked mix into scrumptious cupcakes! Doctor up a cake mix. 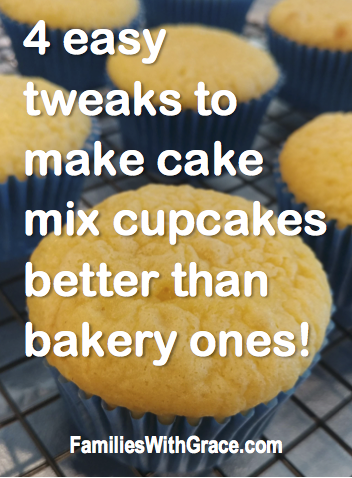 A few years ago, my baker friend, Kayla, shared with me her tip for making delicious cakes and cupcakes. I told you about her with her pillowy soft yeast rolls that make me swoon. This cupcake recipe has been in my life even long and I swear by it! You can use it for cakes or cupcakes. I’ve done both and had excellent results with both. 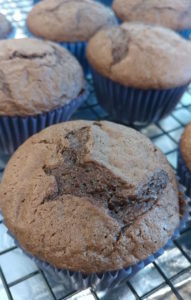 You can see the moist deliciousness of these chocolate cupcakes! Instead of baking from scratch, start with a cake mix. It actually saves money and makes your life easier. (Another tip from Kayla!) Dump out a regular cake mix into your mixing bowl. (I use my beloved stand mixer, who I’ve named!) Add in 4 eggs, 1 cup of water, 1/2 cup of vegetable oil and one small pudding mix that matches the cake. Stir until combined and then stir vigorously by hand or on medium with your mixer for 2 minutes. Reduce the bake time. My great-aunt shared a tip years ago to never bake a cake or brownies as long as the directions say to. She definitely knew her stuff! Of course you don’t want raw batter, but taking your cupcakes or cake out 2-5 minutes earlier than the box says is usually perfect. Check on your cupcakes to see if they are done enough and if not leave them in for 2 more minutes then check again. I check mine by using inserting a toothpick into the middle of a couple of them. If the toothpick comes back clean or with crumbs, the cupcakes are finished. If it comes back with wet batter, they are not finished. Fill all tins the same. In order for all 12 of your cupcakes to need the same bake time, they need to be the same size. I usually fill my cupcake tins about 3/4 full, which is a little more than the box mixes say because I usually get 22-23 cupcakes from a box mix instead of 24. No matter how much you fill them, though, make sure they are all pretty equal. You could totally measure the batter for even better accuracy, but I totally just do it by eye. I bake out my cupcakes my Rachael Ray muffin tin because it really is so awesome. I have realized that it’s time for me to invest in a second muffin tin for making so many cupcakes because it would make my life a bit easier. If I’m making a cake, I reach for my Rachael Ray 9×13 cake pan, which nothing sticks to! Remove the cupcakes from the pans immediately. If you use liners, then you can remove cupcakes from the pans immediately. Then the hot pan doesn’t keep cooking them. (It is also good if you are baking more cupcakes because you can move on quicker to the next batch!) 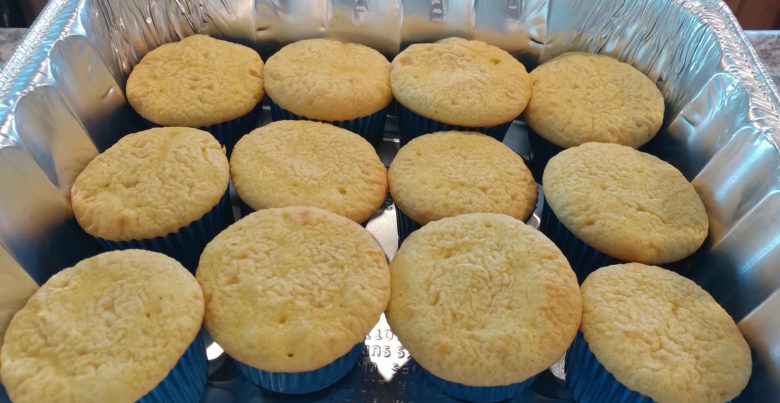 I use a butter knife to gently pop the cupcake up and transport it to a cooling rack or wax paper to start cooling. Sometimes I use a couple of fingers to hold it steady on the knife, and sometimes I wear an oven mitt to do so. I’ve found my fingers are easiest and I really don’t get burnt, but do whatever you’re comfortable with. Store them well. Because of time constraints, most often I bake cupcakes the day before the party when we need them. As long as they are stored out of the air they are just as moist and fresh the next day — if not more so! My current favorite solution is the large, disposable roasting pans. They fit 24 cupcakes each and usually come with plastic lids. 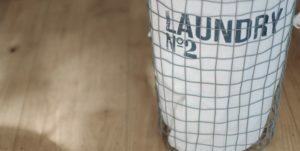 I love these also for easy transport to the party. 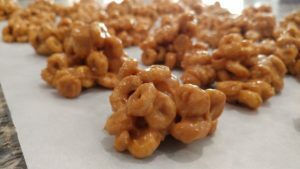 Looking for an icing recipe? 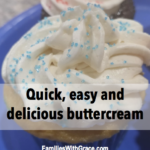 Be sure to check out my recipe for quick, easy and oh-so-delicious buttercream. With just a few basic ingredients and a mixer (handheld or stand), you can whip up this delectable icing in just minutes!